Happy New Year! I enjoyed a little blogging break during the Holidays to enjoy some time with my family. My husband and I had a quiet night in with some champagne and a good movie last night and it was perfect. 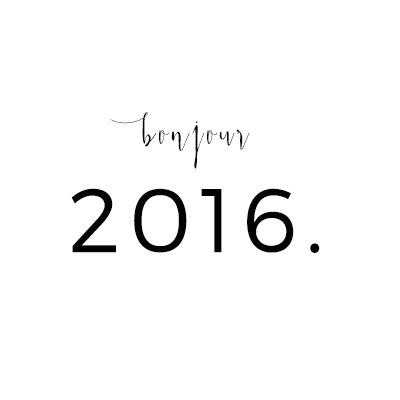 2016 has officially started and it is time to reflect and set goals for the year to come. I did not make any resolutions last year - I was too busy being a mama to an adorable 2 month old. But this year, there are definitely some things I want to focus on besides being a mama and I thought I would share them with you. ▷ I want to focus on my relationship with my husband. We have an amazing partnership, we love each other and are both very hands-on when it comes to parenting our son and taking care of our household. But being a mother can be consuming and I want to make sure to focus on my marriage as well. ▷ I want to live a curated life. What does that mean, for me? Basically to focus on quality; to carefully select the people and items I surround myself with. Invest in quality pieces and quality relationships, even if it means having fewer of them. ▷ Last but not least, I want to live purposefully. In 2016, I want each day to count, to have a purpose, to be fulfilling. This is not to say I was lost before. Nor that I think it be easy to not wish some days away. But I really want to try to live mindfully, to find a direction to every day. Are you making any resolutions for 2016?